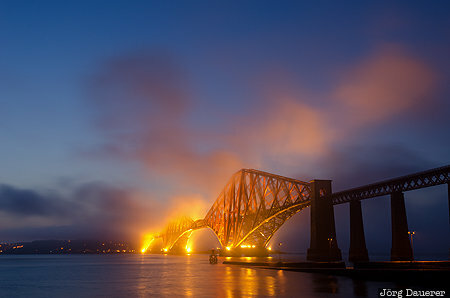 The Forth Rail Bridge (also called Forth Railway Bridge) is a cantilever railway bridge over the Firth of Forth in the east of Scotland which was opened in 1890. It is seen here from Queensferry flood-lit at the blue hour after sunset as wafts of mist come in from the North Sea and the Firth of Forth. Queensferry is in the south west of Scotland in the north of the United Kingdom. This photo was taken in the evening of a sunny day in July of 2013. This photo is part of the exhibition Urban Fog (October 2018). This photo was taken with a digital camera.